Upgraded 1097Ft2 three-plus-one bedroom bi-level in Glenwood on a huge 10,800ft2 crescent pie lot facing Jack Horan park with outdoor swimming pool.\r\rThe main floor has been opened up with a breakfast bar open to the upgraded kitchen with maple cabinets and stainless steel appliances. The living room and dining room have newer oak hardwood floors and great light. \r\rThe house offers a sense of wide open spaces that is rare to find in the city, especially when you are located so close to so many surrounding amenities. \r\rA wonderful view of Jack Horan park fills the (newer) living room window and there is a huge and very private backyard filling the kitchen and rear windows as well. \r\rThe basement is finished and being a bi-level, the windows are large and space is bright. There is a large family room which also boasts a park view and the master bedroom with walk-in closet and three-piece ensuite bath is in the basement\r\rIf you like the feeling of open spaces at home and in your yard but you want to have amenities close by, this home will be for you. It offers a unique combination of virtues that will be very hard to find anywhere.\r\rThe backyard is south east facing with a huge driveway/parking area, a double heated garage, firepit area a two-tiered deck as well as a 16 X 32 outdoor swimming pool (newer liner). \r\rEven with all of that the yard is expansive and does not feel the least bit crowded. \r\rThere is an outdoor three piece bathroom attached to the house for pool use. 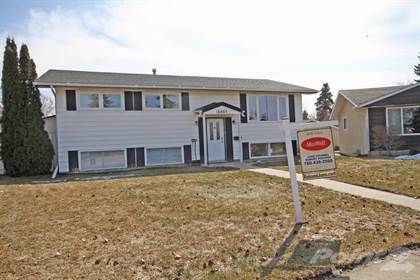 Hi, I'd like to find out more information about 16803-98A Ave. Thanks so much!